The Walking Dead Season 6: Episode 3 "Thank you" features a very jarring scene that will no doubt be discussed by fans for a very long while. If you have not seen it then you may turn away. In the episode "Thank you" Glenn Rhee is apparently killed. He is following around the cowardly Nicholas when they are trapped on top of a dumpster by a mega horde of zombies. As the two stand upon the dumpster Nicholas shoots himself and seemingly falls into and pushes Glenn down with him. We then see Glenn's face as blood flies and a variety of organs are pulled out. The show seems to scream out .......GLENN IS DEAD! See these organs he is dead! However, I really think he is alive. First, its kind of an akward and non emotional send off for one of the shows most beloved characters. The show has many deaths but they never waste them. Also if he did die here there would be no remains left for an emotional farewell. 2nd the camara angle was awkwardly panned on Glenn's face only. 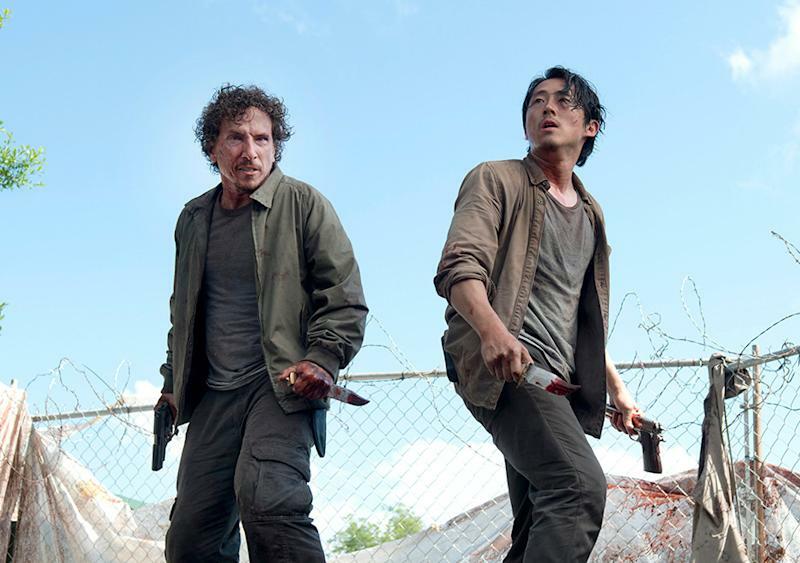 Two men fell into the walkers and the organs could be from the other guy Nicholas who fell on top of Glenn. My guess is that we won't know for sure for a few weeks. The next episode will seemingly shift to the perspective of the other characters. That said some how, some way I think Glenn Rhee lives!